When Autumn rolls around at this time of year, for me, there is nothing more satisfying that having a cosy day in, baking a classic cake. 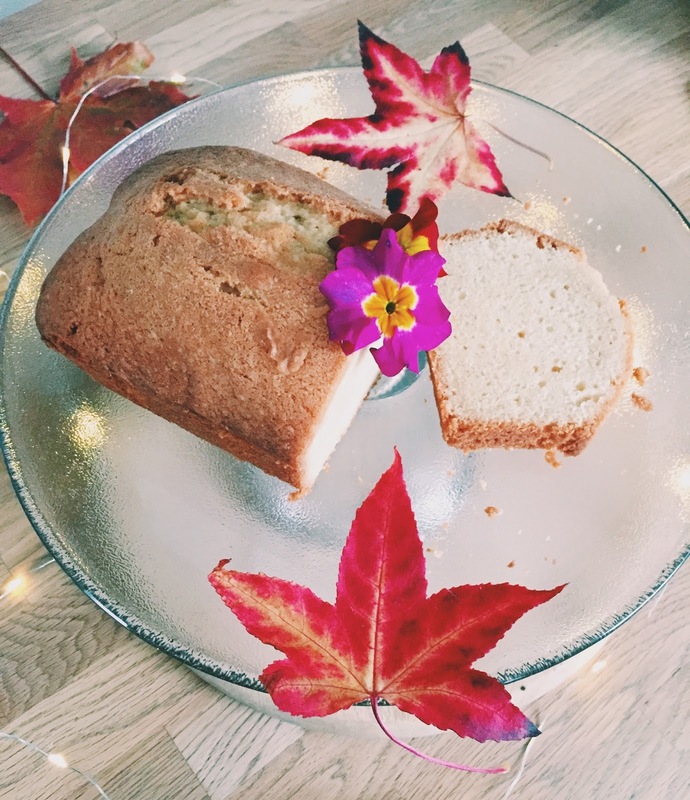 This week I decided to go simple and bake a Madeira Loaf cake. This sturdy, more dense version of your well-known Victoria Sponge cake seems to side more on the Autumn team because of it's golden brown colour, it's comforting taste and how it radiates a sense of relaxation and winding down which Autumn always conveys. As well as this, I get a sense of nostalgia and sentiment from a Madeira Cake as its always the cake that my Grandma bakes. My Grandma is the top family baker; she has baked nearly every single one of my birthday cakes as well as cakes for charity and Wedding Cakes. And, while you may have dreams of a chocolate wedding cake, she (and perhaps many others) would consider it a fact that, because of it's hardy, full-bodied consistency, the Madeira Cake is always the best. The grated zest of 1 lemon. For preparation, grease and line the tin that you're using. With this recipe, you don't have to use a loaf tin but that's just how I wanted mine to be. Set the oven to 160 degrees Fan or Gas Mark 3. Start by weighing and combining your butter and sugar. Cream the two together with an electric whisk until light and creamy - this could take around 2-3 minutes of mixing but, honestly, can be different for everyone. Never put your butter in the microwave; the heat from the butter could end up making your eggs go nasty. Once you're satisfied with your creamy, sugary goodness, go ahead and crack all three eggs into a jug or glass and lightly beat them. Add this gradually into your sugar-butter - preferably in three parts - whilst using your whisker again. At this point, your mixture will loosen up and start to look a lot more like cake batter. Add in a few drops of Vanilla essence/extract/flavour ( just add as much as you desire) along with the zest of a lemon. I grated about 2/3 of 1 lemon for this mixture but, if you want the mixture to be more lemony then you can do the whole thing and even add a little bit of juice. Next, weigh your flour and ground Almonds. If you wish, you can replace the ground almonds with ground rice - again, all depending on your taste. Fold these ingredients into the mixture until fully combined; you may find the mixture quite tough and dough-like but don't worry. Also, don't worry if it isn't, just believe in yourself. Always fold flour into your cake batter and never over-mix. Over mixing causes too much gluten which can change the texture of the cake at the end and means you get less 'fluffy' results. And, seriously, that's it. I can't believe it either. That's all that's required for a delicious, winter-warming cake. Gently spoon the batter into your lined loaf tin. A great tip (that I learnt from my grandma) is to always add a well into the middle of a cake to stop over rising - so, using a spoon, carefully move your batter towards the edges of the tin. Never hit the tin with you mixing spoon. In fact, never whack the side of your cake bowl; this can cause the air in the eggs to escape meaning your eggs 'collapse' and can cause problems with rising. Pop the cake in the oven for around an hour; you should have a healthy crack through the middle and a golden brown colour. My oven has some sort of passive aggressiveness towards me for some reason and likes to take a long time to bake loaf cakes right through. At 1 hour, I brought my cake out and it was still raw in the middle. I covered the top of my cake in foil to stop it from browning any more and to trap heat in and, after 20 more minutes, it was fully cooked. Always, take your cake out of it's tin when it's still warm. This will ensure you have an easier time trying to get it out and the cake is less likely to sweat. As you can see from the pictures, the madeira loaf has a very consistent density and a very sturdy crust; this is how it should look (if I do say so myself). I'm very happy with how this turned out and there's absolutely NO doubt that I will be baking this again and experimenting with it more.